Can you see an amazing succulent garden? 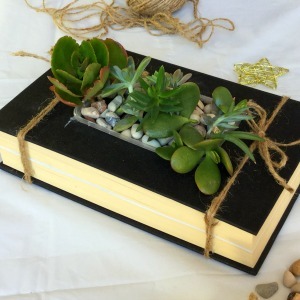 Can you see an amazing succulent garden created out of recycled books? Correct. 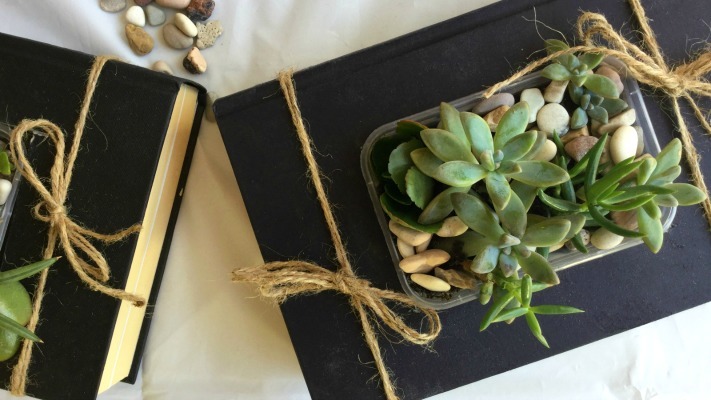 You can grow succulents in just about anything these days, and recycled books is an awesome cost-effective way to enjoy indoor succulents. You can pick up a hard covered book for next to nothing, especially if you go to a market or look in the discount box at your local bookstore. Take the sleeve off the book and check the condition the hardcover is in. This is a great gift for someone who works at an office desk, even a teacher or librarian would love this. Indoor succulents are a great way of adding a little greenery to your office space. With sunlight and a weekly spray of water, you’ll find them easy to look after and lovely to sit and admire. This is a great activity for the kids to do as it’s a relatively easy and fast job, as long as you have an adult handy to cut out the middle section of the recycled books. Let’s check out how it is done. Kidspot also loved our unique planters for succulents featuring our video on their social channel which was pretty cool. 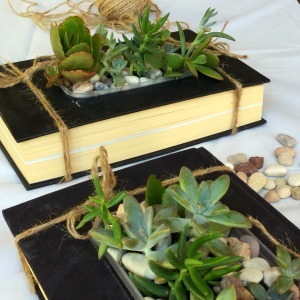 Repurpose your old books for the ultimate teacher’s gift. We know a few school librarians that would love these! We used small plastic containers that fit perfectly in the shape of our recycled books allowing for a nice amount of space around it. Turn the container upside down and tape around the outside of the container to form a square. Tape down the two hardcovers of the book so they don’t move. This is where the adult steps in. Using your multi-function tool, cut out the inside shape of the square to the depth of your container. It doesn’t need to go to the bottom of the book, just as far down as the container needs to sit. Remove all of the cut pieces of paper leaving a hole for the container. Carefully remove the tape. Tip 1: Choose tape which can be removed without taking the book cover off. Tip 2: Get a few extra recycled books in case you need to do a test run. Take two pieces of twine for each book and tie the book ends down so the book stays shut. Place the book to one side. Working with the container, fill with the succulent mix and then plant your succulent cuttings into the mix. Top up with soil and then add decorative stones on top of the soil. Lightly wet the soil with a spray of water. Now you can add the planters to the recycled books.